Today is the 125th anniversary of the birth of John Boynton Kaiser (1887-1973), a librarian and a philatelist. Kaiser is one of many librarians who collect or have collected postage stamps. He was, however, one of the first to collect postage stamps which depict libraries and librarians. Kaiser had a successful career as a librarian which included serving as administrator of the Tacoma (WA) Public Library, the University of Iowa Libraries and Library School, and the Newark (NJ) Public Library. He served as librarian at Camp Knox, Kentucky during World War I. He was also a serious philatelist and received the Walter McCoy Award for Excellence in Philatelic Writing from the American Philatelic Congress in 1953. The award was for his article Bibliography: The Basis for Philatelic Research which was published in the 1953 Congress Book (note: this article was also reprinted as a separate publication by the Philatelic Library Association in 1953). 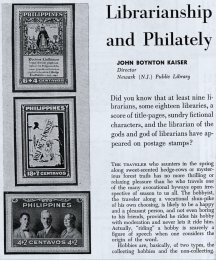 In the July, 1955 issue of Library Journal, Kaiser wrote an article titled “Librarianship and Philately” in which he introduced the library community to the collecting of postage stamps related to libraries and librarians that has since been called “bibliophilately”. Kaiser’s article in the Library Journal also makes note of many “parallelisms” between librarianship and stamp collecting. As a bibliophilatelist myself, I appreciate Kaiser’s early efforts to identify postage stamps related to libraries. A much broader approach to bibliophilately was written about by Leona Rostenberg in a series of articles in 1977 for the American Philatelist. Those articles were later published as a book titled Bibliately in 1978 by the American Philatelic Society (search for “Bibliately” in the APRL online union catalog to find philatelic libraries with this book). I discovered bibliophilately via a 1982 article by George Eberhart titled “Biblio-philately” in the magazine American Libraries. I have established a webpage on “Bibliophilately Resources” for those who would like to explore this topic further. Previous Previous post: Are your books properly shelved?